Grandparents who are present and committed can be one of the greatest influences in your children’s lives. However, just as it takes new moms and dads some time to figure out the ropes and find their parenting groove, grandparents will face a similar learning curve. By taking time to discuss the following topics, you can head off any potentially hurt feelings down the road. 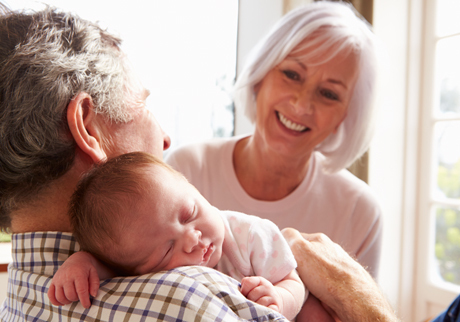 Some grandparents might feel slighted if they’re not your first choice when heading out, while others might feel like it’s a responsibility they’re not interested in taking on. Gauge which side of the fence they’re on and respect their decision. Just because some grandparents aren’t enthusiastic about babysitting, it doesn’t mean they can’t still have a great relationship with your kids. Similarly, grandparents who are keen to help out, but who might not be physically up to the task, won’t necessarily be able to provide you with the peace of mind you need when you’re away from your children. Regardless of your parents’ or inlaws’ financial situation, it’s wise to set limits on the value and types of gifts they give your children. It might not matter as much when your kids are babies, but by the time they’re toddlers, some hefty expectations could be set. It’s important to tread carefully on this topic—after all, dictating how other people spend their money can be touchy—but if done properly, it can ward off awkwardness when your child unwraps a gift that you don’t think is appropriate. One final thing to think about: setting up an education savings plan that family members can contribute to is a great way to take away some of the pressure of gift-giving. It’s fair game to assume that when the grandparents visit your home, your rules apply. That might mean that kids can eat in the family room, or shoes can be worn in the house. It only makes sense, then, that you would extend the same courtesy at their house—if certain rooms are off limits to children, or if noisy play isn’t appreciated, then it’s up to you to enforce those expectations. That said, sometimes the tension around family visits is too much to handle, even for close-knit families. If that’s the case, then consider organizing family get-togethers in neutral territory—a picnic in the park, or a weekend away at a nearby hotel are great alternatives that can provide lasting memories. Try to let go of any expectations around how grandparents will interact with your kids. Some grandparents will get on their floor with their grandchildren and lavish them with tickles and silly songs, while others will prefer to hang back a bit. If you notice the latter, you might want to consider that some grandparents simply don’t remember (or don’t know how) to play with kids. It might be helpful to give suggestions, such as reading a favourite book or going on an outing, but keep it simple so they can build their comfort and confidence.